Two key economic reports out today require closer scrutiny. Their positive readings may not be all that they appear to be on the surface. Both the MBAA’s Mortgage Applications Index and the weekly unemployment claims were reported as positives this morning. But just how good were they? Seasonally adjusted purchase mortgage applications were up 5.5% week to week. Sounds great, but then the MBAA noted in its press release that on an unadjusted basis they were up 3.1%. That’s funny, I didn’t realize there was a change of seasons between October 29 and November 5. But still, up is up. The MBAA does not make its index public, although it does report weekly changes in the seasonally adjusted index, and it used to report the actual index level, so it’s not too hard to reconstruct. Reuters actually reports the seasonally adjusted historical data in a weekly table that it publishes. But the MBAA doesn’t want the unwashed masses to have access to the actual unadjusted data. Someone might notice that the market is bad. Besides, they make good money selling the data, then prohibiting purchasers from republishing it. This is an altruistic industry group working for the good of all Americans. So how “up” was this week? It was down 14.6% from last year at this time, down 35.2% since the April end of the homebuyers’ tax credit, and down 25% since April 2009, which was the last time mortgage rates were remotely near current levels. Today the 30 year fixed rate is around 4.28%. In April 2009 the lowest it got was 4.62%. Wait… that can’t be right. All the economists say that lower rates stimulate housing demand. Rates are down by 34 basis points from the last cycle low and purchase applications are down 25%? I guess the economists are wrong about lower rates stimulating demand. I am shocked. SHOCKED. Here’s a chart. The mortgage rate line is on an inverse scale so that you can see directly how well lower mortgage rates correlate with an increase in housing demand. There is no correlation. In fact, the lower mortgage rates have gone over the past couple of years, the weaker demand has gotten. 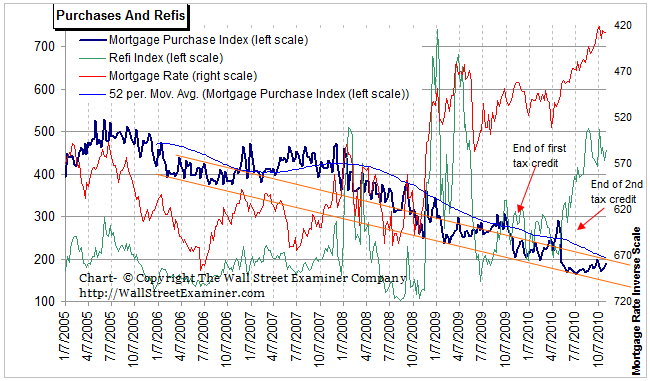 The Fed’s suppression of mortgage rates by buying MBS, GSE, and government paper has been an abject failure. So gee, let’s do more of it! Maybe that will work. The other thing I note is the massive jump in purchase mortgage demand over the past 4 weeks. Wow. That’s really something. We are on the road to recovery! Let’s see what happens in the next week or two when the line gets to the 52 week moving average. Until that line is broken and turns up, the market will remain weak. This index is virtually real time. It foreshadows the NAR’s pending home sales index by more than a month to the release of that data and existing home sales by two months. The mortgage applications assure us that the next couple of reports from the NAR will continue to be awful. The second item released this morning was the weekly claims data. Claims were widely reported to be down by 24,000. But the truth is that they were really up by 28,000. But hey, who’s counting. We don’t care about the real numbers, we just care about the seasonally adjusted hocus pocus. That’s what everybody reports. Here again, I didn’t realize that the seasons changed between October 30 and November 6. Did it get a lot colder where you are? Did a bunch of businesses lay off workers because of the weather? How stupid is it to apply massive seasonal adjustments to week to week changes that actually reverse the direction of the change? The raw data is the real data, and it was indeed up by 28,000. It is true that this is a better performance than some years, and it was certainly better than November 2008 when the economy was collapsing and November 2009 when it was still in recession. In those years, the first week of November saw jumps of 73,446 and 49,324 respectively. So this year was a lot better. However, there are 8 MILLION fewer people eligible to claim unemployment benefits than there were in November 2008. They have used up their benefits. Too bad for them. Actually the number may be even greater than 8 million, but that’s what the Department of Labor is reporting. They use a 6 month moving average that is current through June. We know that many more people have dropped off the rolls since then. We don’t know if just as many have gotten jobs and regained eligibility. The 28,000 new applicants last week were also higher than the first week of November 2007, when the recession was just starting. Then there were 22,500 new claims. 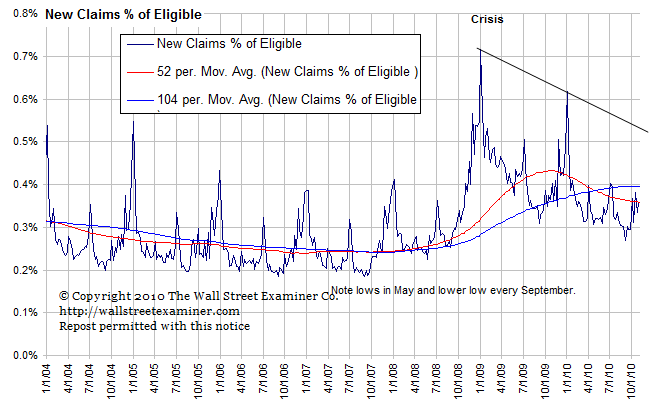 Here’s a chart showing how claims stack up based on the number of claims as a percentage of those eligible. That rate is just a little below last year at this time and it has reached an inflection point. QE2 is supposed to drive that line back down, keep the 52 week moving average declining, and force the 2 year moving average to start down. At the very least, it should keep the seasonal peak at year end well below the trendline connecting 2008 and 2009. In a few weeks we should begin to get a picture of how successful it is. In the meantime, instead of believing all the mainstream reports that new claims were so great, maybe we should take them with a grain of salt every week. The actual real numbers often tell a different story. Stay up to date with the machinations of the Fed, Treasury, and foreign central banks in the US market, along with regular updates of the US housing market, in the Fed Report in the Professional Edition, Money Liquidity, and Real Estate Package. Try it risk free for 30 days. Don’t miss another day. Get the research and analysis you need to understand these critical forces. Be prepared. Stay ahead of the herd. Click this link and get in RIGHT NOW!